"He (Grandpa Mason) also shows us that old, broken, ferocious, 'lost cause' cats still have value and are worthy of compassion." Far from the maddening crowd at an undisclosed location in British Columbia an estimated ten-year-old gray and brown formerly homeless tom named Grandpa Mason is waging a lonely and uphill battle against the Grim Reaper and accordingly could only have either days or months in which to live. His is unquestionably a sad and disturbing story but that serves only to make its telling all the more imperative. His recent history began last October when he was trapped and removed from a farm by the charity Tiny Kittens of Fort Langley, forty-seven kilometers southeast of Vancouver. 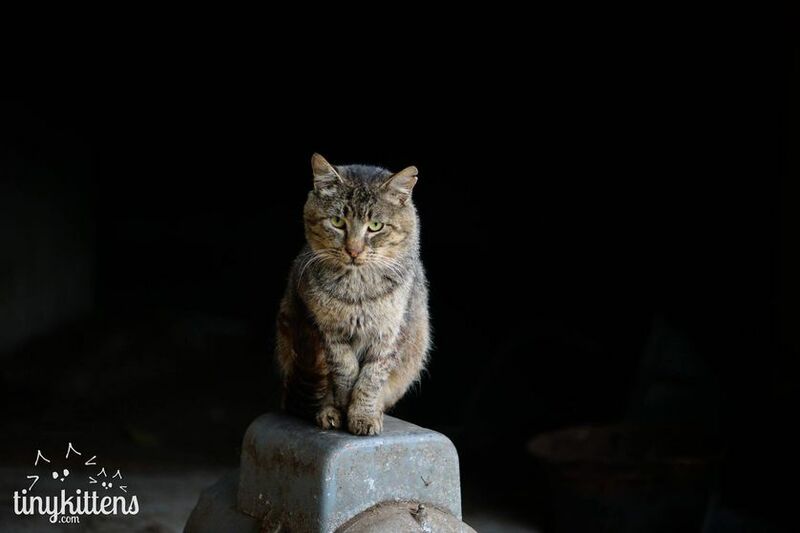 His uprooting and removal was necessitated after a developer had purchased the farm and began to tear down the derelict barns that he and roughly fifty-nine other cats and kittens had called home for an undetermined number of years. Absolutely nothing has been disclosed about either his early years or how that the managed to survive for so long on his own, but given his ingrained fear of humans it would appear that he likely was born on the farm and lived his entire life without so much as a glimmer of human contact and support. Much more importantly, judging from his rapidly deteriorating health his deliverance did not come a day too soon. In particular, he had a massive growth on the bottom of his right paw, his tail had been broken multiple times, his teeth had gone bad, and he was suffering from several unspecified infections. Tiny Kittens attended to those maladies, sterilized him, and was planning on returning him to the wild when it discovered that, tragically, his kidneys are failing. Fearing that he would not be able to make it through another winter on the outside, the organization was left with the choice of either killing him off or bringing him inside. Fortunately for him, it chose compassion over expediency. 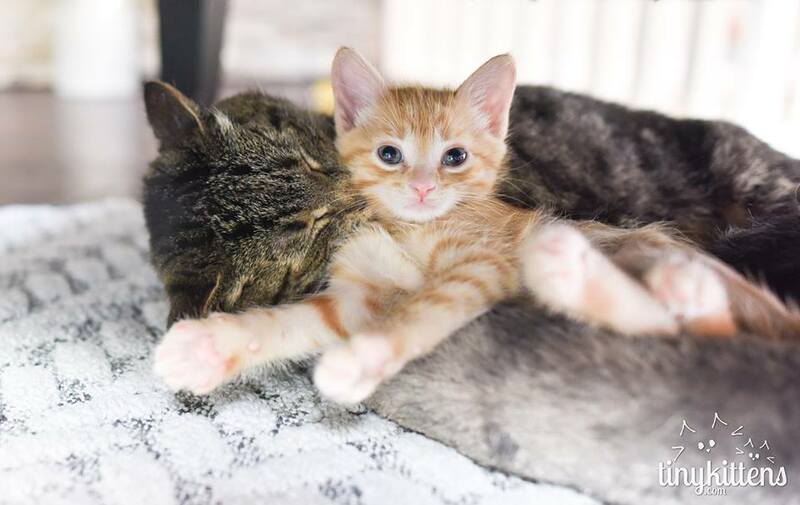 "We are a no-kill organization, and believe that any life is worth saving as long as we are able to alleviate suffering," founder Shelly Roche wrote in an untitled and undated article that appears on the charity's web site, www.tinykittens.com. "Mason's many scars told us how hard he had fought to survive this long, and we were determined to give him a chance to experience comfort, safety and freedom from pain during his sunset months." Although Roche wisely had elected to exercise the only morally acceptable option available to her under the circumstances, that did not necessarily make the task at hand all that much easier. 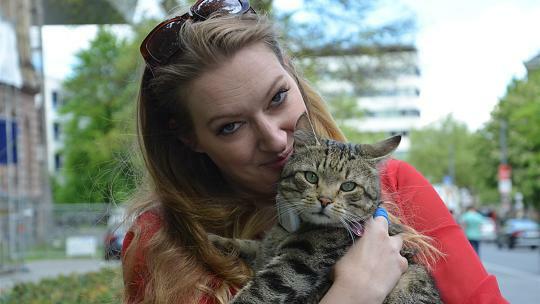 "He is one of the oldest ferals we have seen, and throughout his recovery, he made it clear his feral instincts were deeply ingrained," she pointed out. Consequently, his unsocialized nature coupled with his rapidly deteriorating health meant that adoption was all but out of the question. That in turn left Roche with little choice other than to bring him home with her to live in her house. The details have not been spelled out, but it apparently was, to say the least, a rather interesting adjustment period for the both of them. Eventually, Mason reached the point where he would engage in play with Roche but other than that he still did not want to have much to do with her. It was only after he had begun to play with his toys and to rearrange the throw rugs and pillows that she realized he was beginning to adjust to his new home and life. 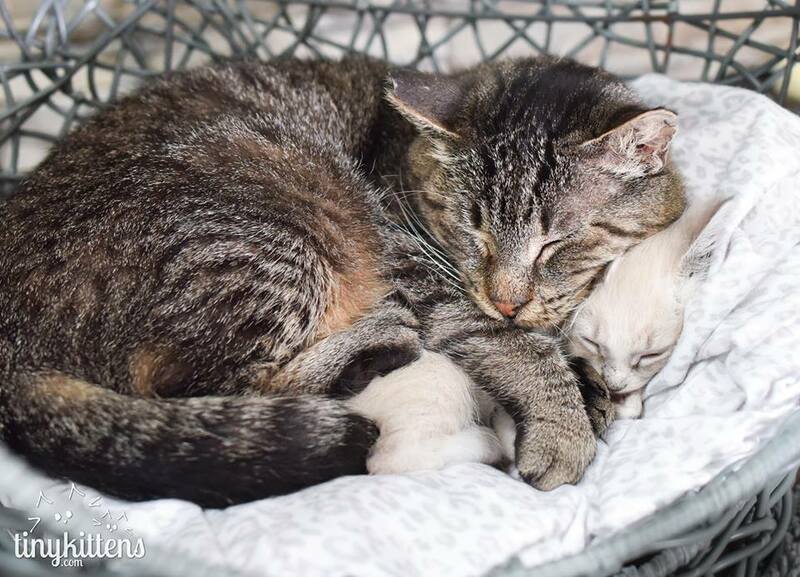 "I thought that was a pretty great outcome for an old, terminally ill feral cat, and I didn't think it could get any better," she wrote on her web site. As things eventually turned out, she was completely wrong about that. "The wonderful thing about the cat is the way in which, when one of its many mysteries is laid bare, it is only to reveal another," Robert De Laroche wrote in his 1997 tome, The Secret Lives of Cats. "The essential enigma always remains intact, a sphinx within a sphinx within a sphinx." So, too, was it with Mason and Roche's epiphany came when she introduced several kittens that she was fostering to him. Halfway expecting the grizzled tom not to want any part of the rambunctious little ones, she received the shock of her lifetime when something altogether different occurred. He sometimes calls out to them in order to gain their attention and even grooms them. "...the one thing missing for Mason had been contact with another living being, and while he didn't want that from me, he had clearly been craving it from his own kind," Roche concluded. Actually, it is not all that uncommon for toms to assume some type of a role in the rearing of kittens although in most instances such activity is pretty much confined to keeping them warm and minding the nest while their mothers are away. In Mason's case, however, there appears to be a good deal more going on, such as perhaps a pressing need for companionship and possibly even a few latest pangs of paternalism. According to his latest round of blood tests, his kidneys have stabilized. His weight is steady and he is said to be looking "great." Even so, it does not appear that his story is destined to have a happy ending. "We are trying to be realistic and prepare ourselves that he likely only has months left, but we are determined to make those months the best he's ever had," is how that Roche summed up Mason's rather gloomy prospects. Tiny Kittens has not given up on him completely, however, in that he is receiving some form of unspecified treatment. What, if any, impact that is going to have on his prospects is not known. It is not known how that either Maxi or Arthur have fared but on the average only fifty per cent of transplant recipients live for as long as three years. In spite of that rather disappointing success rate, some cats do beat the odds. For instance, the University of Pennsylvania in Philadelphia claims on its web site that one of its transplant recipients lived for at least thirteen years. In Mason's case, his options likely are pretty much limited to diuresis, dialysis, chemotherapy and, possibly, stem cell treatments. Another possibility would be a regimen of home care consisting of daily injections of subcutaneous fluids and a special diet rich in omega three fatty acids. "I've seen even very sick cats, cats who need hospitalization in the beginning, do really well on home care with an owner who was willing to give it a try," Patty Khuly of Sunset Animal Clinic in Miami told the San Francisco Chronicle on August 18, 2009. (See "Caring for a Cat Whose Kidneys Have Failed.") "What makes the difference in how well a cat with kidney failure does is not how sick they are, or how bad their kidney values are on a blood test. It's the attitude of the owner." The odds against Mason are definitely long but all is not lost just quite yet. 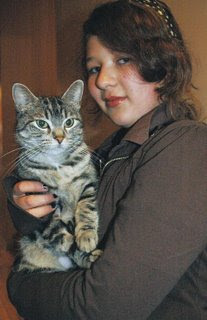 "Many of these cats who were on the brink of death can be brought back with supportive care at home," Khuly continued. "Not only brought back for days or weeks or months, but years. You just don't know unless you try." Needless to say, the administration of subcutaneous fluids to a formerly homeless cat like Mason would not be an easy feat to pull off but Roche and the staff at Mountain View Veterinary Hospital in Langley City, eleven kilometers south of Fort Langley, should be resourceful enough in order to be able to master that difficult chore. If doing so would help to extend his life, a few scratches and bites would be a small price to pay. Founded in 2013 in order to help cats and kittens by, inter alia, mounting rescues, providing veterinary care, foster parents, placement in new homes, and sterilization services, Tiny Kittens also has embarked upon an ambitious agenda aimed at educating the world about both the plight as well as the intrinsic value of homeless cats. 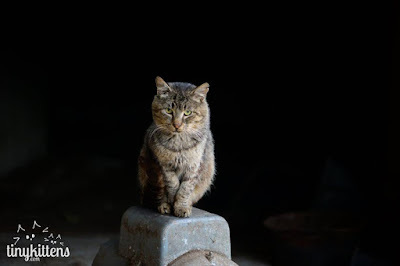 "He (Mason) is helping us raise awareness about feral cats, the hardships they face, the love they have to give, and that spaying and neutering is a very easy way to prevent the suffering that results from cat overpopulation," Roche writes on her web site. "He also shows us that old, broken, ferocious, 'lost cause' cats still have value and are worthy of compassion." The only thing that she fails to mention is the astronomical death toll that the failure to sterilize takes on kittens that are born premature and stillborn; countless others are, for one reason or another, deserted by their mothers. Being subjected to a long series of continuous pregnancies also takes a heavy toll on females and some of them actually die while giving birth. Unneutered toms likewise also have a hard row to hoe. In addition to the cuts and scratches that they often sustain while fighting amongst themselves over fertile females, their incessant roaming also makes them easy prey for motorists who are only too happy to intentionally end their lives. Ideally, cats that are allowed to breed need to be healthy, well fed and cared for, and domiciled. In the case of females, the number of litters that they are allowed to produce needs to be restricted. Above all, owners need to be willing to take responsibility for any and all kittens that their cats bring into this cruel and ailurophobic world. Beyond its rescue and heuristic efforts, Tiny Kittens has demonstrated through its rescue and care of Mason that homeless cats can be socialized. Secondly, its choice of life over death serves as a model for all feline rescue groups to emulate. There cannot be any disputing that Mason's lot in life has been an outrageously unfair one. Tant pis, there is not any power on earth that is capable of undoing the multitude of wrongs that have been done to him. Although there is not any way of putting the sand back into the hourglass and thus giving him back his youth and health, it would be a small step in that direction if Tiny Kittens and its veterinarians were to put their heads together and come up with some means of extending his sojourn upon this earth even if it is only for a very brief period of time. He most definitely is a rare treasure who is more than worthy of such an eleventh-hour effort. The days and weeks ahead are destined to be difficult ones for him. His flesh is going to grow progressively weaker and his spirits are going to begin to flag. Under such trying circumstances, the urge to give up the ghost is going to be almost too much to resist. There likewise may come a point in time when Tiny Kittens wearies of the cost and effort that are required in order to sustain an ailing cat. It accordingly will be sorely tempted to either simply let nature take its course or, worst still, to get rid of him once and for all. "Stoff für viele weitere Abenteuer der Fellnasenbande habe ich jedenfalls mehr als genug." The gargantuan lengths that some owners are prepared to go in order to exploit their cats for financial and professional gain continue to astound as well as to infuriate at the same time. Was noch schlimmer ist, they are so ruthless and callous that they knowingly and willingly place the lives of their companions in grave jeopardy without so much as a second thought. That is precisely what thirty-six-year-old Nadine Biewer has done by turning loose her gray and brown cat, King Loui I, to roam the perilous streets of Aachen in Nordrhein Westfalen. In particular, she allows him to wander the six-hundred-twenty-one-acre campus of Rheinisch-Westfälische Technische Hochschule (RWTH) where he has become a huge favorite of the more than forty-four-thousand students who attend Deutschland's largest technical university. 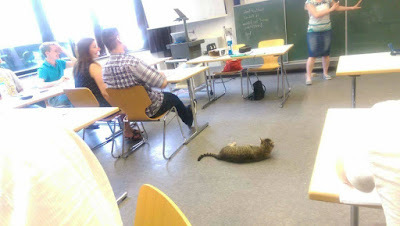 While on campus, he hangs out with the pupils and even attends some classes. That latter activity demonstrates beyond the shadow of a doubt that his roaming is fully supported by the school's five-thousand-nine-hundred-thirteen instructors and three-thousand-three-hundred-fifty-one administrators. Be that as it may, a college campus is hardly a fitting environment for a footloose cat and that petit fait is demonstrated by some of the students taking it upon themselves to feed Loui all sorts of inappropriate food. According to his Facebook page, Aachener Campuskatze, that in turn has led to him having been sickened once in May by Dönerkebab und Eis, again in June by an unspecified food, and at no doubt other times as well. That, generally speaking, is pretty much standard conduct on the part of students. For instance, for more than a decade those in attendance at Plymouth College of Art (PCA) in Devon used to feed all sorts of food to a truly beautiful brown and white homeless cat named PCAT. "She used to hang about and now and then you'd do something like hand her a cheeky bit of ham from your sandwich," sophomore photography student Dan Richards said back in 2012. "She was really chilled out and laid back -- pretty cool for a cat." Although it never was disclosed if she ever were sickened by the scraps and tidbits tossed in her direction by Richards and other students, that which is not in dispute is that the school did practically nothing in order to ease her plight. For instance, it never fed and watered her, provided her with veterinary care, sought to place her in a home, or undertook any measures designed to ensure her personal safety. The only positive thing that it is known to have done for her was to provide her with an unheated outdoor kennel in which to sleep. As is the case with Loui and RWTH, no moral bond ever was established between PCAT and PCA and therein lies the rub. Captive audiences, whether they are to be found in either an academic or a business setting, think and behave much like prisoners doing time. Das heißt, their members are so bored by what they are doing that they will welcome almost any distraction that helps to relieve the tedium and thus makes the hours of drudgery go by faster. They thus willingly accept all the attentions, amusements, and affections that cats like PCAT and Loui have to offer without returning anything other than a few kind words, pats on the head, and scraps of food. Beyond that, they could care less what happens to them. 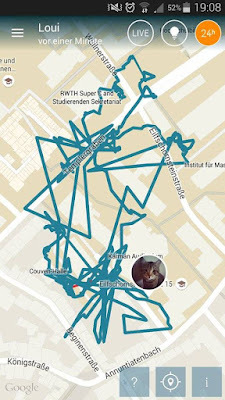 The most pressing concern as far as Loui is concerned arises whenever he leaves campus and ventures into the clogged streets of the Innenstadt. The Aachener Cathedral (the Dom), where Karl der Große was crowned Holy Roman Emperor in 800 A.D. and subsequently buried fourteen years later, is one of his favorite haunts and he often can be spotted at the entrance to the Domschatzkammer, a museum containing religious relics that date back to the early Middle Ages. He also is known to frequent Burgerservices am Katschhof as well as many businesses and cafes in the vicinity. With two-hundred-fifty-thousand residents, Aachen is a big city and the area around RWTH and the Dom is unquestionably its most congested part. It is so dangerous in fact that scarcely a day goes by without either a pedestrian or a bicyclist being run down and that is despite the willingness of the Aachener Polizei, in stark contrast to their utterly worthless American counterparts, to take these matters seriously. Because of his friendly disposition and trusting nature, Loui is his own worst enemy and it is precisely those qualities that have gotten him into trouble more than once. For instance, back in May he wandered into a delivery truck and was AWOL for an unspecified length of time. It is far from clear exactly how long that Loui has been wandering the forbidding streets of Aachen. 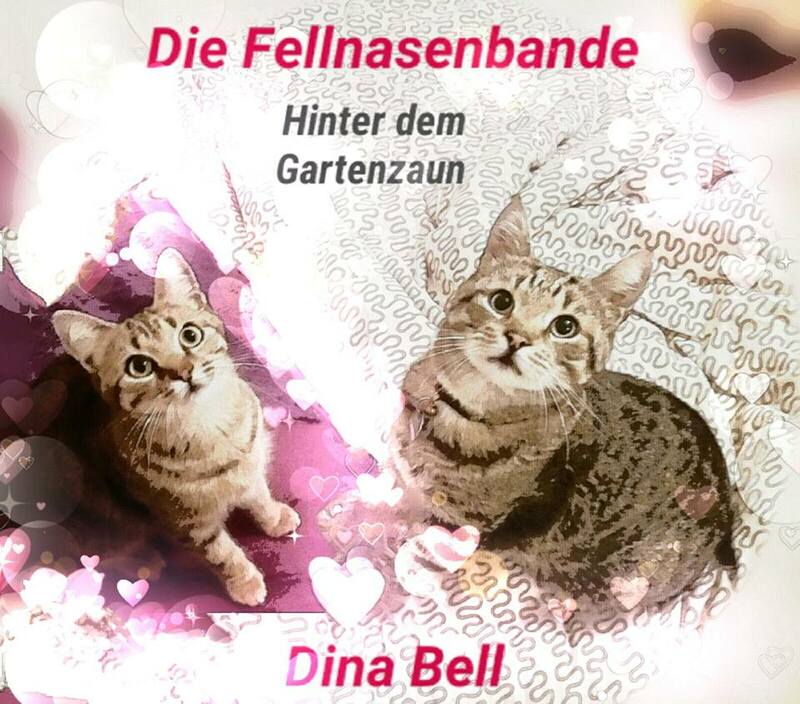 Although Biewer's Facebook page was established in 2010, it strains credulity that any cat could survive for seven years in streets as congested and violent as those in Aachen. The ambiguous title of her Facebook page also invites the suspicion that Loui may have had predecessors. If there is any truth in that supposition, that in turn brings up the disturbing issue of what has become of them. 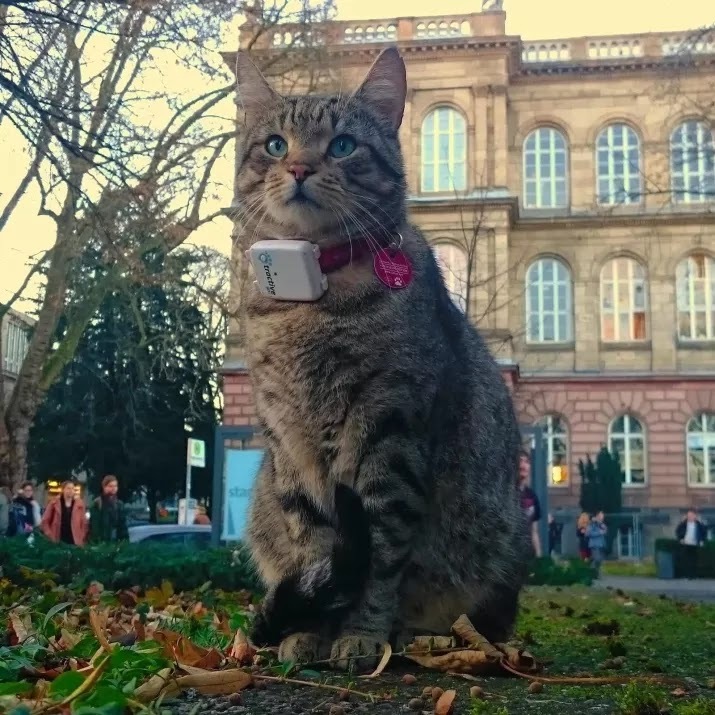 Another piece of incriminating information comes courtesy of an untitled August 14, 2015 posting on RWTH's Facebook page wherein Loui is identified for the first time as the cat that has been visiting its sprawling campus. If, on the other hand, Loui had been Biewer's original Campuskatze, it does seem rather odd that it would have taken the college five years to have tumbled to his presence. That is important because what could be going on here is a case of long-term and serial abuse of multiple cats. If so, RWTH has become complicit in Biewer's crimes. It likewise is not known how much time that Loui spends on the street but the impression, rightly or wrongly, is that it is all day with him returning home only at night. According to information contained online, Biewer lives in a four-story building located at 20 Annuntiatenbach which is located between the Dom and RWTH. Moreover, since the ground level of her building is devoted to a photography shop, it would appear that she carries him downstairs in the morning and subsequently dumps him in the street to fend for himself. Either she or a confederate then has to locate him in the evening and transport him back home and up the stairs. What she does with him on weekends, holidays, when classes are out, in times of inclement weather, and whenever special events are held in the Innenstadt has not been explained. It is strongly suspected, however, that at such times his care often is fobbed off on others. It accordingly is clear that this is not a usual case of whereby a cat is allowed out into the yard and then strays to parts unknown; rather, Loui is deliberately dumped in the street and condemned to spend his days there until he meets his Waterloo. Every bit as revolting, he is being treated this way so that Biewer can make money and advance her career as a writer. For example, he already has attracted more than five-thousand fans on Facebook, two-hundred-eighty people follow him on Instagram, and he has his own accounts on both Twitter and Jodel. Most promising of all, Biewer recently published an e-book on Amazon under the Schriffstellername of Dina Bell entitled Die Fellnasenbande. Hinter dem Gartenzaun. The book concerns the adventures of not only Loui but her other resident feline, Mia, and two purely fictional strays. A print edition is expected out soon. What Biewer is doing to Loui should be illegal but, regrettably, that is not the case. Furthermore, she is far from being the only individual to ever have so nakedly exploited a cat for financial gain. 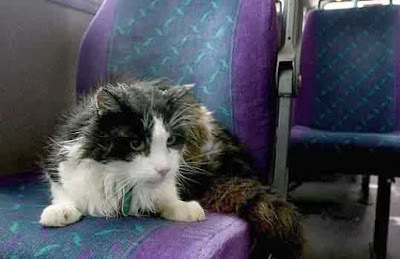 For example, between 2006 and 2010 a handsome, longhaired tuxedo named Casper from the Barne Barton section of St. Budeaux in Plymouth, Devonshire, was allowed to ride First's buses around town all by his lonesome. His owner, sixty-five-year-old Susan Finden, put up with that madness even though she knew from the very outset that she was playing Russian roulette with his life. "We think he's about twelve years old but he has no road sense whatsoever," she early on admitted. "He just runs across the road to the bus stop." On January 14, 2010, he stepped into Poole Park Road where he promptly was mowed down by a speeding taxi driver. Like Biewer, Finden got at least one book out of Casper's exploits and his image still adorns some of First's buses. It is not known with absolute certainty, but it is believed that both Loui and Mia were adopted, most likely from a local rescue group. Although there may be certain similarities in their backgrounds, their personalities are as different as night and day. Whereas Loui is a gregarious and outgoing male, Mia is a shy female who still carries around with her the psychological scars of her difficult upbringing. It therefore seems unlikely that she could be anything other than an exclusively indoor cat. The picture of Biewer that emerges from all of this is that of an ambitious professional who is either too busy or uncaring in order to take proper care of Loui during the daytime. 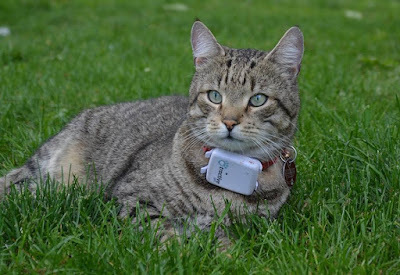 While it is true that she has equipped him with a satellite tracking collar, that would appear to have been done more so in order to gather information for her various writing projects than as a safety device. The same criticisms are equally applicable in regard to Biewer's irresponsible guardianship of Loui. The case against her is furthermore compounded in that she is having difficulty even keeping batteries in his tracking collar. Even though she is now laughing all the way to the bank and has forged a budding literary career for herself, she nonetheless insists that none of that was planned. "Ich habe die ganze Aufmerksamkeit nie beabsichtigt oder geplant," she vowed to the Aachener Zeitung. "Loui liebt einfach die Menschen, und die Menschen lieben ihn." All over the world it is always the same auld lang syne: bad things generally can be counted upon to happen to cats that become too friendly disposed toward humans. For their own safety and well-being, they never should be encouraged to go anywhere near strangers and, above all, to accept food from anyone other than their owners. Much more poignantly, a cat is said to have the intellectual development of a four-year-old child and absolutely no halfway conscientious parent ever would turn loose a toddler in the street. Since cats accordingly do not have any conceivable way of anticipating the multitude of dangers that lurk around every corner in this highly ailurophobic world, that makes it doubly imperative that they have responsible owners who are willing to ensure their personal safety. Biewer's claim that Loui loves strangers also does not ring quite true. Unless they have not been sterilized and therefore are on the prowl for mates, cats generally are more than content to be homebodies. 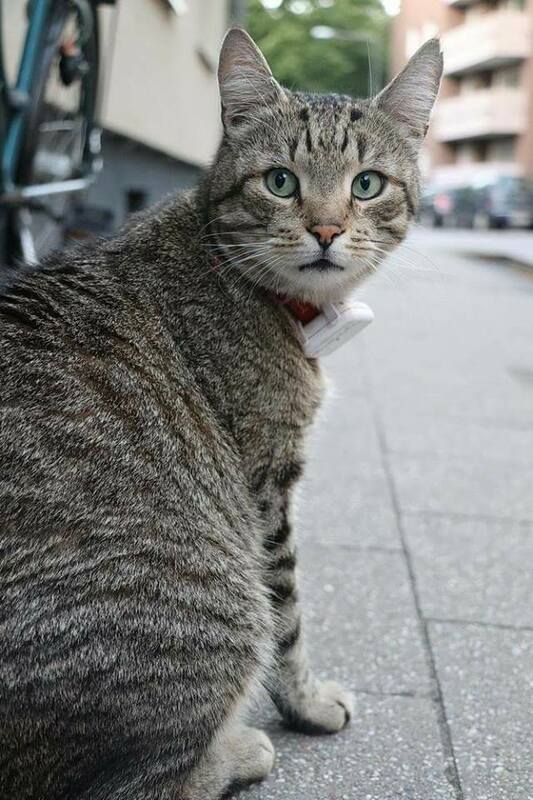 Loui, who most likely was sterilized long ago, therefore does not have any valid excuse for living on the street. Furthermore, it is an outright lie for Biewer or anyone else for that matter to claim that a sterilized cat would prefer to live in the street as opposed to being at home with a loving and caring owner. In Loui's case, he has not freely chosen to live as a Vagabund; im Gegenteil, that is the lifestyle that she has foisted upon him for her own selfish and exploitative reasons. If, on the other hand, she were willing to stay home with him, to entertain him, and to sprinkle in a few treats now and again, he not only would be infinitely happier but, much more importantly, safe as well. Besides, anyone who is unable to write with five or six cats drapped on top of her and pestering her nonstop needs to find another vocation. As if her abject neglect and naked exploitation of him were not bad enough, Biewer hypocritically claims that she is passionate about animal welfare issues and in furtherance of that objective has pledged to donate half of the proceeds from her new tome to animal protection groups operating in the Aachen area. Given that such monies have been raised at Loui's expense, it is hard to imagine how that any such organizations could accept them while at the same time remaining true to their missions. The roll call of shame does not merely include Biewer and those charities that accept money from her but it also extends to Rector Ernst M. Schmachtenberg and the other administrators, professors, and students at RWTH, the holy men of the Dom, social media, Amazon, and the Aachener Zeitung. Since none of them have raised so much as a finger in order to protect Loui's precious and fragile life, they are every bit as responsible as Biewer for how that he currently is being treated as well as for what ultimately becomes of him. Make no mistake about it, for addition to being callous and exploitative what is being done to Loui constitutes a textbook case of animal abandonment, neglect, and endangerment of the first degree. Consequently, anyone even so much as tangentially involved in Biewer's machinations is richly deserving of substantial time in jail. "Stoff für viele weitere Abenteuer der Fellnasenbande habe ich jedenfalls mehr als genug," she declared to the Aachener Zeitung. Quite obviously, she does not believe a word of that because if she did she would immediately bring Loui home and keep him there with Mia. Given her unwillingness to do even that much for him, coupled with the intransigence of local animal protection groups, the time has come to, sadly, start a death watch for him. Under such perilous and utterly hopeless circumstances, it is all but impossible to envision any other dénouement for him than the ones that robbed the world of both PCAT and Casper. Photos: BuzzFeed (Loui outside RWTH), Katharina Menne of the Aachener Zeitung (Loui and Biewer), Facebook (Loui in class, PCAT, map, book jacket, Loui in the grass, and close up), and The Sun (Casper). "I hope they're (her three cats) still there." The deadly inferno that broke out during the small hours of June 14th and subsequently destroyed Grenfell Tower in the Kensington section of west London has dominated the news on both sides of the Atlantic for the past three weeks. Lost in both the daily reports chronicling the steadily increasing human death toll as well as the esoteric debates concerning the use of external cladding in order to insulate and beautify the outsides of buildings has been scarcely any mention whatsoever of the fate of the dozens, if not indeed hundreds, of cats that also resided in the Latimer Road house of death. What precious little information that has eked out of London has been sketchy and contradictory but as best it could be determined the twenty-four-story skyscraper contained approximately one-hundred-twenty-seven apartments that were home to somewhere between four-hundred and six-hundred souls. Illegal tenants as well as those who were away on summer holidays no doubt have contributed to the confusion over not only just how many individuals were at home on that god-awful night but also the exact number of fatalities. 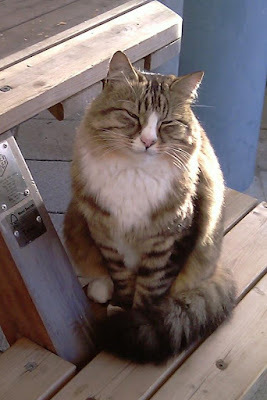 Nevertheless, given that the English are known to favor cats as companion animals, it might not be unreasonable to assume that at least half of the flats contained one or more felines. Although Kensington is an affluent area of the realm that boasts the presence of such well-heeled tenants as the Royal Albert Hall, the French Consulate, and Imperial College, the vast majority of those who resided in the upscale public housing project appear to have belonged to the ranks of the working class and the poor and that in turn may have had a negative impact upon the number of cats actually living in the structure. Yet, it has proven to be all but impossible to find out any information concerning the fate of those cats. For instance, both the dailies as well as the weeklies have avoided broaching the subject as if it were the plague and that in itself is extremely peculiar in that they, as a rule, seemingly never can get their hands on enough stories about the species. The only cat reputed to have made it out of the burning building alive is a brown and white, blue-eyed male named Paucho. Even in his case, it has not been publicly divulged either how that he masterminded that bit of deering-do or what has happened to his caretakers. 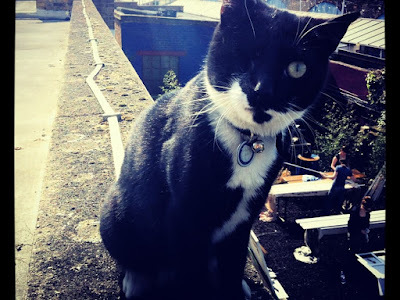 The Bush Theatre, located a little less than two kilometers away in the Shepherd's Bush section of the borough of Hammersmith and Fulton, has offered to provide shelter for children displaced by the fire but even in doing that it has failed to so much as mention the plight of the displaced cats. That is all the more odd in that it has a trio of resident felines of its own. "If your kids need a cuddle, Marley, Caramel and I are here," a dashing tuxedo named Pirate, reportedly told the Express of London on June 14th. 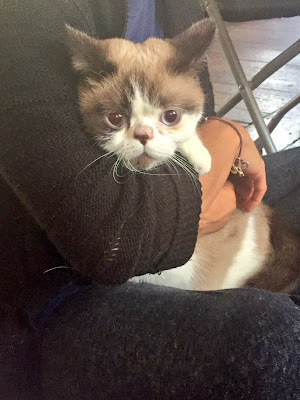 (See "London Fire: Local Theatre Offers 'Cuddles with Cats' to Terrified Children.") "Thoughts with those affected by the Grenfell Tower fire." His mate, jet-black Marley, was equally forthcoming. 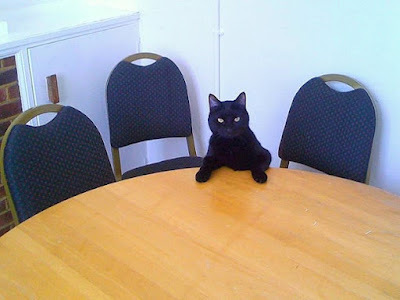 "We are here if you want to chat with humans, a quiet place, a shower, Wi-Fi or cat cuddles," he chipped in to the debate. "So awful this has happened." Fires, explosions, and other cataclysmic events present a myriad of nearly insurmountable obstacles for cats that live in apartment blocks. First of all, in addition to the damage that the flames and smoke can rapidly inflict upon their fur, whiskers, lungs, and eyes, it is totally impossible for them to open either the doors that lead out of their apartments or those that block entry into the stairwells. They likewise do not have any means of activating the elevators, even if they should be still in service. Leaping from a window is a remote, albeit death-defying, possibility but even that last-ditch escape route is only available to them if one has been left ajar. They therefore are totally at the mercy of their owners for their deliverance. The latter therefore must not only have cages ready at hand but, much more importantly, they must be willing to take the time and effort that is required in order to locate and corral them. Next, they need to cover the cages with wet towels in order to protect their occupants' tiny lungs from succumbing to smoke inhalation. Finally, they must transport them through the smoke and fire to safety and for that task it is essential that they have flame-resistant and sturdy cages that will not either catch on fire themselves or come apart at the seams whenever their terrified occupants start to trash about in panic. It accordingly is long overdue that derelict local fire and public safety officials took into consideration the safety of cats and thereby enacted protocols designed to ensure their safe evacuation from high-rises in times of emergency. If they are unwilling to do that, it is then time to, perhaps, consider banning cats from apartment blocks. This world most definitely does not need any more cats to be burned alive. Generally speaking, however, the solemn duty of evacuating cats from burning buildings falls squarely upon the shoulders of their owners. With human nature being what it is, far too many of them forget all about their faithful companions in times of emergencies and instead think only of saving their own worthless hides. 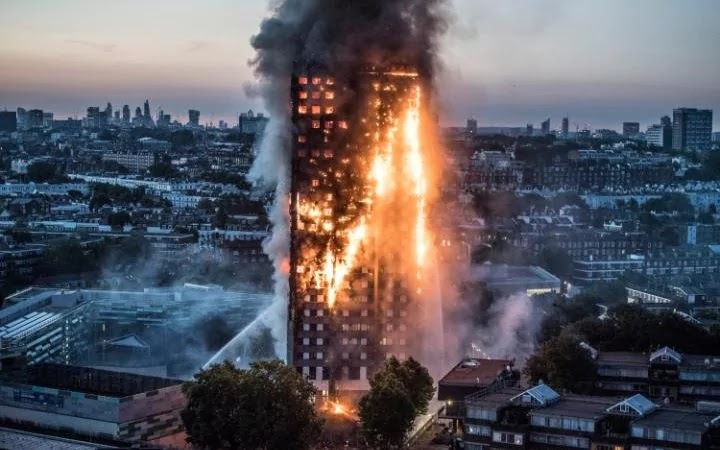 If past history is any guide, that is exactly what a good portion of the residents of Grenfell Tower and surrounding apartment blocks did on the morning of June 14th. The only person who so far has been willing to publicly admit to such shameful conduct has been fifty-year-old Esther Watts of nearby Hurstway Walk. Earlier on December 31, 2009, forty-six-year-old Edgar K. and forty-four-year-old Susi S. of Altshausen in Baden Württemburg ran out on their cats, Lumpi and Sissi, after an early morning blaze had engulfed their apartment. Sissi miraculously survived by hiding underneath a bed but nine-month-old Lumpi was not nearly as fortunate. On September 9, 2008, forty-three-year-old Warren Niles and forty-four-year-old Joan T. Ferreira of New Bedford, Massachusetts, were charged with arson for setting their apartment on fire in order to collect on a renters' insurance policy. In doing so, they did not even bother to first remove their three resident felines. Yet in spite of all of that, the fate of the Grenfell Tower cats remains unexplained. Almost as importantly, the question of how best to protect cats that live in skyscrapers had yet to filter into public consciousness. It thus seems clear that as far as most owners, public officials, and rescue groups are concerned, the welfare of cats does not count for any more in times of domestic emergencies than it does in wartime. C'est-à-dire, they are considered to be expendable and of little value. The only glimmer of hope that cats have lies in the petit fait that not all of their guardians are as selfish and uncaring as Edgar K. and Susi S. For example, twelve-year-old Jennifer Powder of Prince Albert in Saskatchewan made sure that her four-year-old, multicolored cat, Cuddles, made it out alive when the home that they shared was destroyed by a fire on October 12, 2007. 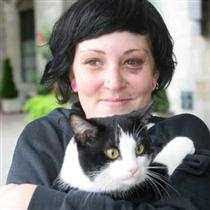 Twenty-six-year-old Kristen Eliasson acted every bit as admirably when she wrapped her cat, Bacon, in a blanket and then spirited him to safety after a fire had engulfed her Ottawa apartment earlier on October 16th of that same year. Even though she wound up losing not only her abode but all of her personal belongings as well, she was singing anything but the blues. Photos: the London Metro (Paucho), The Telegraph (Grenfell Tower ablaze), The Guardian of London (Pirate and Marley), The Prince Albert Herald (Cuddles and Powder), and the Ottawa Citizen (Bacon and Eliasson).